There will be two open days at the Denge sound mirrors this year. The open days are scheduled for 10:00 to 15:00 on Saturday 7 July 2018 and Saturday 1 September 2018. There will be a cash-only charge of £5 per adult, £2.50 per child (RSPB members free). There are more details on the Romney Marsh website events listings for July 2018 and September 2018. The open days are generally the only way for the public to access the Denge listening ears close up, although there have also been some photography days, so it might be worth keeping an eye out, if you are seriously interested. 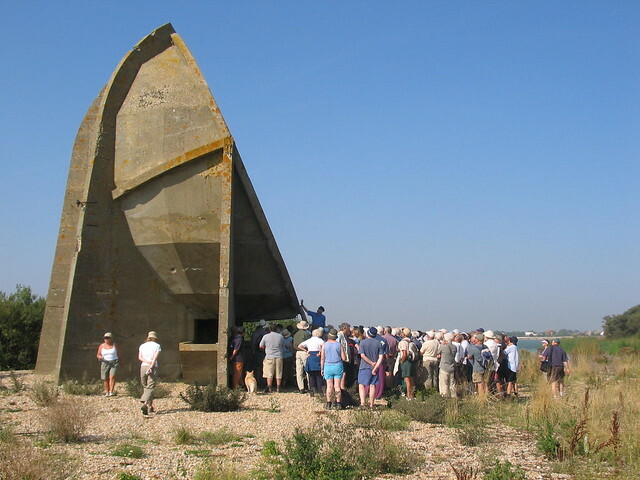 This year’s annual open day at the Denge sound mirrors is scheduled for 10:00 to 15:00 on Saturday 15 July 2017. Open days are the ONLY WAY to access the Denge listening ears. There will be a cash-only charge of £4 per adult, £2 per child or £3 per student, with a family discount of one free child per family. Under 5s, carers and RSPB members are also free. The RSPB – which now owns the site – is holding an open day at the Denge sound mirrors on Saturday 23 July 2016, from 10:00 to 15:00. Open days are the ONLY WAY to access the Denge listening ears. Price: Free. Donations are welcome. On this day only, RSPB Dungeness will open up the reserve for free! Come and see what this fantastic place has to offer and get up close to our recently acquired, historical Sound Mirrors (or Listening Ears)! Come along for the day where we open them up for everybody to have a wander around the site and talk to our staff and volunteers about what we are doing to give nature a home here. So why not spend the day surrounded in nature and history and afterwards head to the visitor centre for a cup of tea or an ice cream to round the day off nicely. Please note that I have absolutely no connection with the RSPB or the open days. 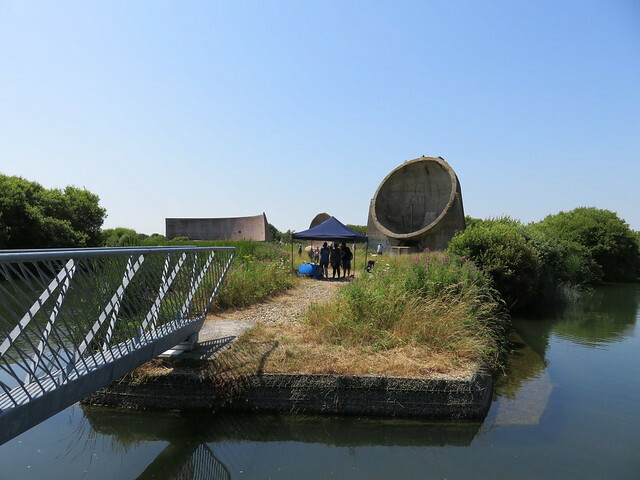 Make you sure that you confirm the details of the open day with the RSPB before going – do not rely on this Sound Mirrors website.